In hidden monasteries and secluded dojo across the Empire, enlightened mystics seek to understand the true mysteries of existence. Some do this simply out of a need to find their place in the world. Some seek a path to power. Others wish to unlock this mystery merely because it is there. The answers await, if only you bring the proper questions. * History, tradition, and practices of Rokugan's premier order of monks - the Brotherhood of Shinsei. * Secrets of enlightenment and the paths that one might take to reach it. * New rules for campaigns seeking more dynamic martial arts flavour. * Over twenty new martial arts styles, from the offensive and the defensive to the simply bizarre. 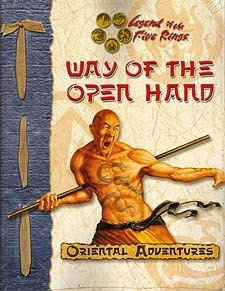 This book is a dual-system supplement for the Legend of the Five Rings Role-playing Game, Second Edition, and Rokugan, the d20 Companion for Legend of the Five Rings. Players and DMs may also find it useful as a source of interesting new feats and abilities for any d20 System campaign. Game Masters running the Second Edition L5R will need a copy of the Legend of the Five Rings Game Master's Guide and the Player's Guide. Players need only the Player's Guide. Dungeon Masters running d20 System games will need a copy of the Player's Handbook, The Dungeon Master's Guide, Oriental Adventures, and Rokugan. Players will need only a Player's Handbook.